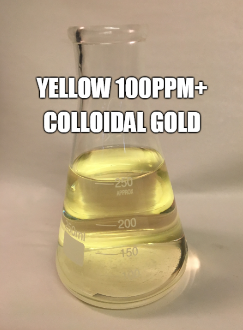 I make my Yellow Colloidal Gold from only 24k .999 pure Gold wire, and pure distilled water (that has been harmonically restructured using a Tesla Purple Plate) that is then put through the process of electrolysis using a simple 12v DC adapter instead of AC like most other use. The lower voltage is much safer and gives you a smaller particle size. I also vibrate all my products to the frequency of 528hz using a piezoelectric transducer and charge them with aetheric energy like my Lightening water. To make this yellow color I also gently boiled the water during the electrolysis process. I then dilluted the mixture with more distilled water to bring the ppm down to around 100ppm.